It is not usual for a person who has seized power through a military coup to heap praise upon his deposed predecessor. Zimbabwe’s new president, Emmerson Mnangagwa, however, has used the opportunity presented by several high-profile occasions to extol former president Robert Mugabe’s virtues. He referred to him as ‘the father of the nation’ in his inaugural address and told his Angolan counterpart João Lourenço on a recent visit to Angola that ‘Mugabe is our revolutionary icon’. And to loud applause, he assured African Union (AU) leaders gathered at the just-ended summit that the former Zimbabwe African National Union – Patriotic Front (ZANU-PF) president is well and safe and that his legacy will be preserved. For many, the most notable aspects of Mugabe’s legacy are an economy on its knees, a repressive system of governance with a powerful executive controlling all key institutions of state and an unforgotten and unforgiven ethnic cleansing of the Ndebele in the 1980s. This was perpetrated to eliminate the Patriotic Front – Zimbabwe African People’s Union (PF-ZAPU) party of political rival Joshua Nkomo and establish a one-party state. Mnangagwa was Mugabe’s go-to fix-it person, who stood by Mugabe’s side and helped implement his often brutal style of leadership for over 50 years. Yet when it appeared in his interest to do so, without showing so much as a flicker of remorse, Mugabe had no compunction in humiliating Mnangagwa in public and eviscerating his executive powers, before firing him from government altogether. Mnangagwa was forced to flee the country by walking through a minefield into Mozambique, or so he says, with presumably Mugabe-approved assassins on his tail. The new president is determined to create the impression that his incumbency is the start of a fresh and democratic era marked by economic pragmatism. But many are scratching their heads as to why, given all the circumstances, Mnangagwa undermines this message by praising the person who they regard as embodying the antithesis of these policies. After all, Mnangagwa is contesting an election no later than August this year, and there are many votes to be garnered from those grateful to him for seeing off the detested Mugabe if he aligns with their sentiments and distances himself from the former president. 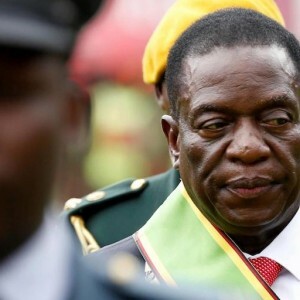 Mnangagwa is probably hoping that his refusal to taste the sweet fruit of revenge, in favour of astute political rationality, will be understood and viewed favourably by voters as the action of a mature and sober politician. The praise lavished on Mugabe is politic for several reasons. It is important for Mnangagwa to counter claims that he came to power via a coup. A simple syllogism thus advances Mnangagwa’s cause: coup plotters denigrate those they depose and do not praise them; Mnangagwa praises Mugabe; ergo Mnangagwa is not a coup plotter. Praise for Mugabe also supports the narrative of the ‘military-assisted transition’. On this version of events, Mugabe was not the target of the intervention by the military. The intervention sought only to neutralise the ‘criminal elements’ around him – including his ‘scheming’ wife. It is these elements, the military claim, that subverted the constitution and usurped presidential authority. Vilifying the former president might suggest that Robert Mugabe was the real target, and not the ‘criminal cabal’. African presidents are also understandably sensitive about being such targets. The AU and the Southern African Development Community (SADC) tolerate all manner of human rights abuses and violations of good governance, but will not tolerate an ‘unconstitutional change of government’. Both policies – tolerating human rights abuses and not tolerating coups – are designed to maintain the status quo and keep incumbents in power. While a Muammar Gaddafi ending for Mugabe would have isolated Mnangagwa in the region, the soft landing provides a dignified exit for Mugabe and enables Mnangagwa to secure support from regional leaders, or at least annul disapproval. There are also those who genuinely revere Mugabe as a liberation icon, and earning their antipathy gains nothing. Furthermore, debate continues to rage as to whether the November military intervention that led to Mnangagwa’s presidency constituted a coup. The person who could give an irrefutable answer to this – Mugabe – has remained studiously mute, to Mnangagwa’s considerable advantage. Things might have been otherwise without the cushy pension benefits Mnangagwa has ordered to be paid to Mugabe, and with a policy of revilement against him. Last, and certainly not least, although politicians can be notoriously thick-skinned about such things, there is the fact that Mnangagwa was closely associated with Mugabe and his policies. He had been fulsome in his praise of his predecessor only a few months before his departure. Mud slung at Mugabe would inevitably boomerang, and for Mnangagwa to suddenly change tack to one of harsh criticism would engender considerable cynicism and cast him as a shameless opportunist. In the case of Mnangagwa, then, it seems in his permanent interest to have Mugabe as a permanent friend.